As travel nurses, you have probably become accustomed to leaving your coworkers shortly after you get comfortable in a position. Odds are you miss some of your coworkers and were more than ready to move on from a couple coworkers as you move on to your new assignment. That’s not uncommon! No one expects you to naturally bond with everyone you work with. In a professional workplace, however, a modicum of social decorum is necessary. As of late, a lot of attention is being given to redefining and elevating relationships between coworkers. Whether it’s a staff meeting for improving communication skills or anti-bullying campaigns, there are always ways to improve your arsenal of tools for positive work relationships. One way to improve relationships with coworkers is to celebrate them! When your colleague has good news, use this as an opportunity to show you’re proud of them and appreciate all they do – in and out of the workplace. This is a way to bring humanity back into your daily work interactions. Did you know Freedom has a No Drama Nursing pledge? It’s important to the culture we build for our nurses. So, how can you tackle these workplace issues on a daily basis? Shelly Gable, a psychologist and professor at UC Santa Barbara is an expert on what makes a good relationship with positive disclosures. You may have a positive life event that you want to share with others. Those are called positive disclosures. Sharing positive life events is part of a balanced society and creates affirmative bonds. According to the work of Shelly Gable, there are four ways a person can respond when someone shares their good news to them. Only one of them builds relationships; the others are each different, but all relationship destroying. Some have a natural ability to have positive interactions. But, some are not savvy to this and need to be given the tools necessary to lift others up. The goal is to be the best version of ourselves – but not just for ourselves. If we are the best versions of ourselves, it benefits our coworkers and the people we serve – our patients! Here is a simple skill that you can easily work into your repertoire to start lifting your coworkers up and show your appreciation for them. Within positive psychology, there is a four-quadrant map that can show you if you are reacting in the best possible way and furthermore, being a better coworker. The goal is to always be in the top left quadrant: Active Construction. Active Construction offers a sincere and enthusiastic response. A response that is supportive and requests elaboration, and always with eye contact. This way, the coworker feels that they are celebrating with you as well. Passive construction is difficult to detect because it appears to be a nice way to respond! However, it will often dismiss enthusiasm with apathy and a low-energy response. Apathetic responses are destructive to relationships when a positive life event is shared because the person sharing could be left feeling that their good news isn’t welcomed. Response: “That’s nice. I’m happy for you.” Coworker continues to work and does not make eye contact. The lower left quadrant, Active Destruction, will extinguish enthusiasm. It is demeaning and dismissive and could leave the person sharing their news embarrassed for bringing their news up at all. This is arguably the worst way to react to someone’s good news. 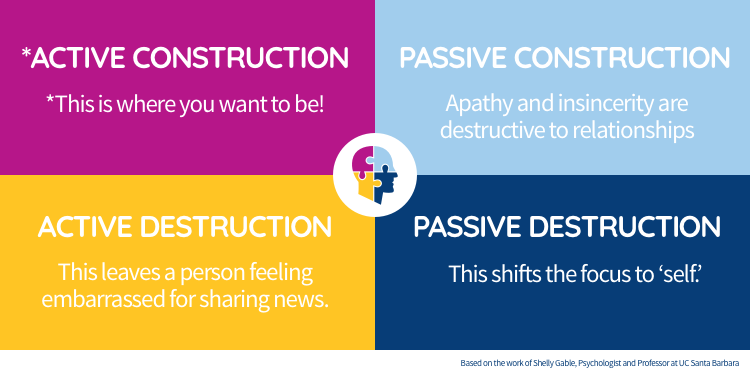 The lower right quadrant, Passive Destruction, brings the focus to yourself. It ignores what was shared and changes the subject of the conversation to be about your news. This can leave the person sharing feeling like their news is of zero interest and feeling overall dismissed. You may feel that you already naturally fall into the Active Construction quadrant in work conversations. However, for others, this could be completely new information and they could be re-thinking the way they interact with everyone in their lives. We all come from a different level of social intelligence based on many things from our upbringing, natural charisma and both positive and negative interactions we have had in the past. Now, when it comes to others sharing good news in the workplace, lift them up and celebrate with them! Whether you’re in or out of the workplace, shoot for the upper left quadrant in any situation in life: Active Construction.